The Neighborhood Watch concept centers on the community and Law Enforcement working together for the safety and protection of a neighborhood. It is an organization made up of citizens concerned about their neighborhood. 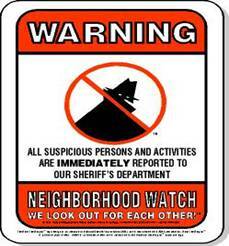 Neighborhood Watch is one of the most effective and least costly answers to crime. Watch groups are a foundation of community crime prevention; they can be a stepping stone to community revitalization.